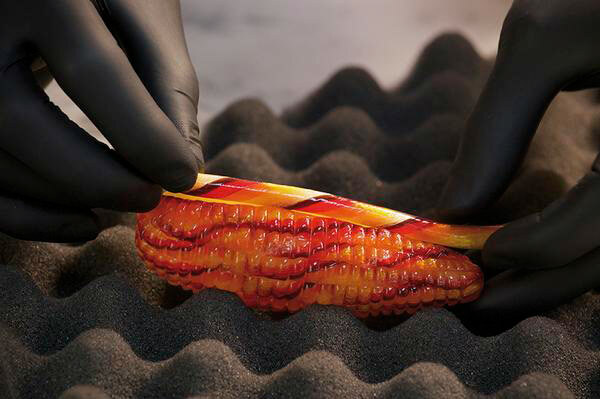 Mastering the world of artistic sugar is one of the most complex challenges that a pastry chef can face. With the help of Frank Vollkommer, passionate defender of this professional side, we go at so good #19, into the secrets to design different decorations that give personality to an artistic sugar work. 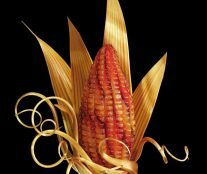 You will learn, among other things, the step by step of an ear of corn décor made of sugar. 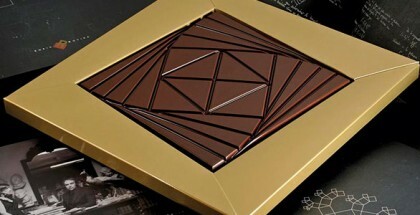 Successfully designing an artistic caramel work requires adding an appropriate aesthetic criterion with the demonstration of a good mastery of different sugar work techniques. 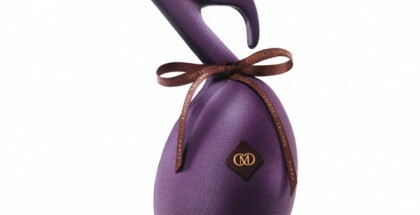 With this premise in mind, Frank Vollkommer has designed for the occasion an exclusive and balanced piece inspired by the elements of the countryside, theme that serves to incorporate decorations with which he unleashes his technical versatility. 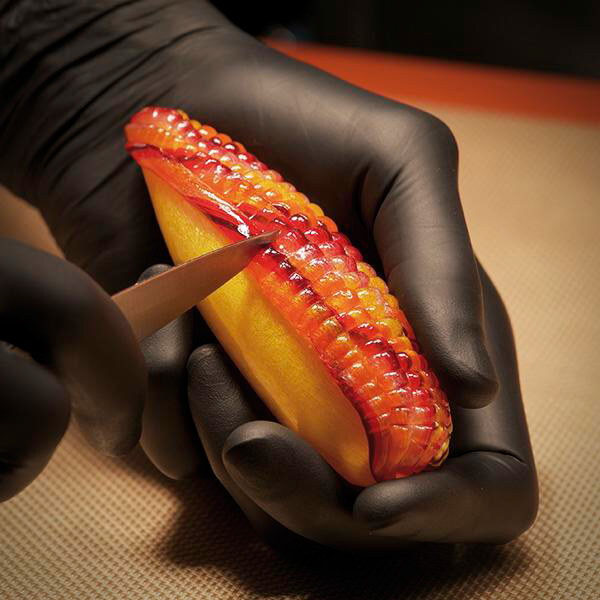 ‘When I teach sugar artistry, I like to incorporate a number of artistic techniques into the design of a showpiece such as hand painting and airbrushing. 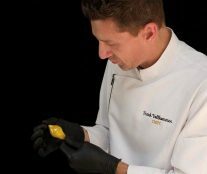 My design philosophy also leans toward the use of practical techniques that do not require the purchase of expensive molds or silicone’, he points out. 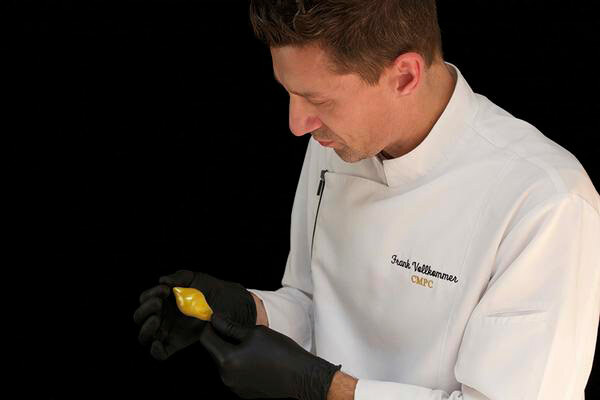 With approximately 50-60g of yellow sugar, blow a small oblique shape that is pointed. 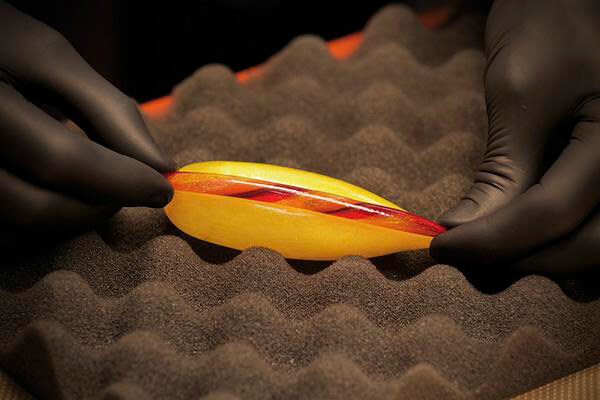 Use your fingers to elongate the shape while adding just enough air to keep the sides smooth (Photo 1). 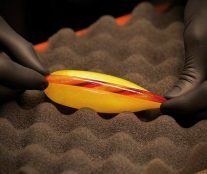 Finalize the shape by cooling the top and closing the air channel at the bottom. Cut the sugar from the pump and cool completely (Photo 2). Using yellow, orange, deep red, white and black sugar, marbleize a stick under the heat lamp. The sugar should be pulled for some opacity, but still warm enough to remain flexible (Photo 3). 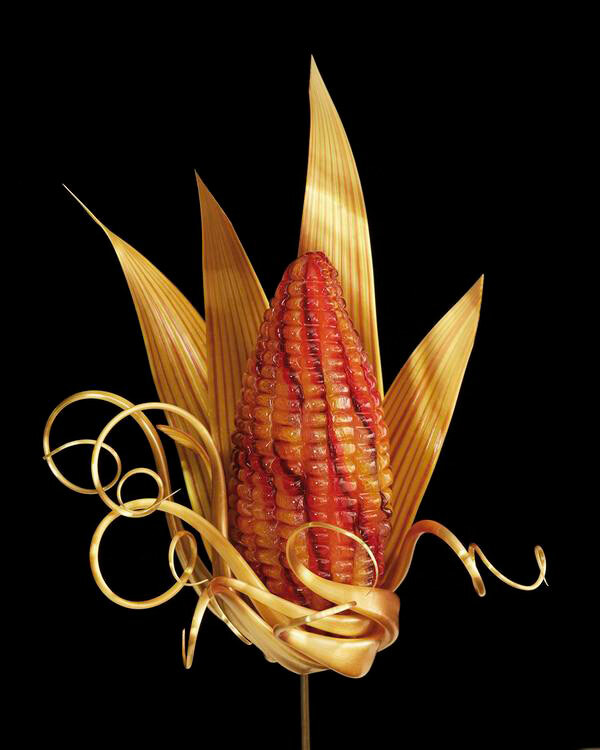 Warm the spiral sugar stick over the alcohol flame and apply to the yellow maize shape. 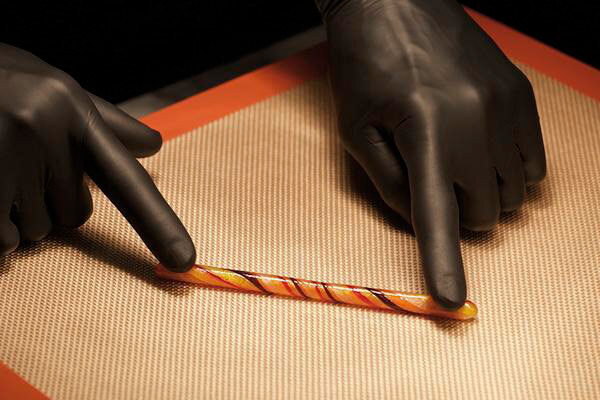 Quickly taper and pinch the ends to remove the excess so that the strip is thinner at the top. 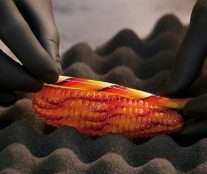 This procedure is done away from the heat lamp to avoid collapsing the blown maize shape (Photo 4). 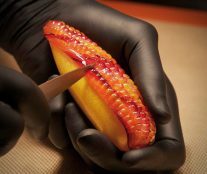 Use a small knife to press the maize kernels onto the strip while temporarily returning the shape to the heat lamp, being careful not to press too hard (Photo 5). Repeat this process until the entire maize is covered in kernel rows. 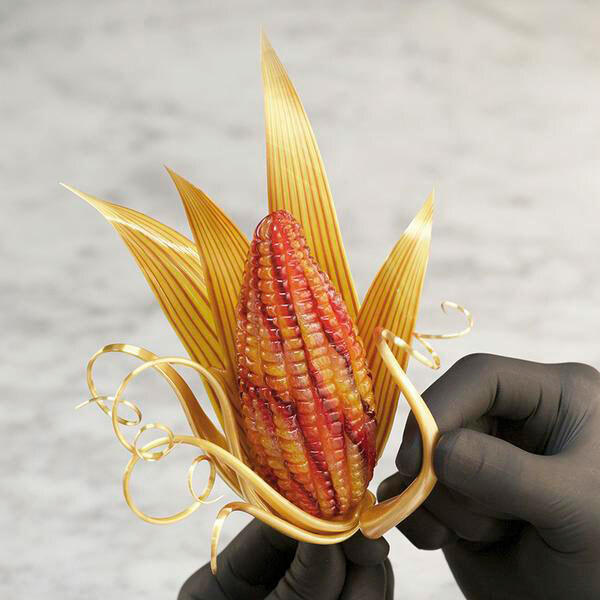 Attach the maize décor to a metal stem that is to later be removed (Photo 6). 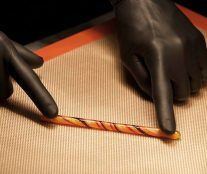 Using gold and brown sugar, attach a few husks using a basic ribbon technique with tapered the ends. 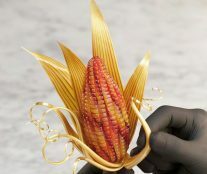 Use the gold sugar to pull tendrils and attach them to the bottom of the maize being careful to hide the connection points underneath. Attaching them slightly warm gives the most natural looking composition (Photo 7). Remove the stem after final assembly (Photo 8). ‘My great friend and colleague Jean-Luc Derron is a genius with things he finds in unlikely places. 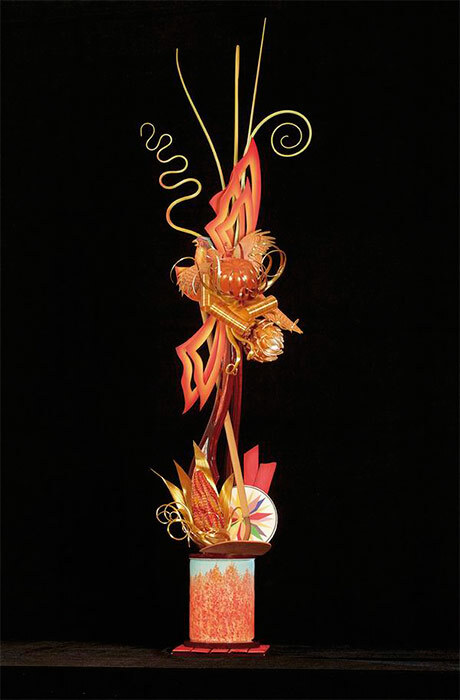 The whisk used to create the blown sugar pumpkin décor was the result of one of his trips to a discount store. Jean-Luc is also responsible for the amazing photography in this article. It is a pleasure to work with such creative people who enjoy pushing themselves to constantly reinvent’, expalins Vollkommer.